The web publication of archived parliamentary meetings is good practice to get interaction from the people in the society. However, accurate and correct information is essential for this purpose. A misspelled name, makes an unprofessional impression, but - much more important - leads to confusion and to loss of faith from the people in the system and thus in the parliament generally. 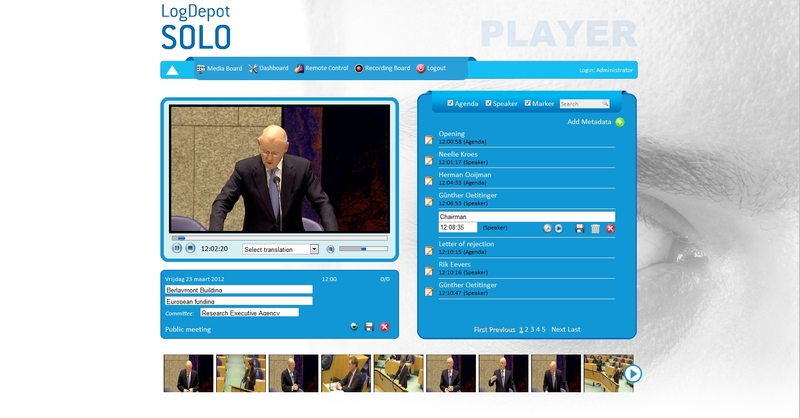 That is why our unique Mediaboard module on the LogDepot system allows full review and correction possibilities of recorded meetings, before or after publishing them. Both speakernames and agenda items can be modified, added, deleted etc. When everything has been verified, the publication of the debate onto the Connected Views Video on Demand platform is a matter of pressing a button. The upload process of the video, audio and all of the metadata is a full automatic process and the debate will appear in the cloud when this process is finished successfully. Even if - despite all good efforts - a mistake is discovered after publication, this mistake can be corrected and the whole debate can be re-published. The Video on Demand platform will automatically determine that this is a re-publication of an existing debate and will replace the debate with the older, incorrect version. LogDepot is also used for Web-Publishing by Court Rooms and City Councils.